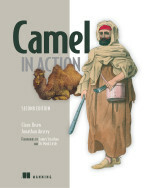 Over a year ago we did start on what seems inevitable - A demand in the market for an Apache Camel book. Looking back in my mail archives, the first trace I can find about how all this began was dating back to February 2009. It was just a month after Apache Camel became a Top Level Project at Apache (actually long overdue). Now fast forwarding to today, April 25th 2010, its with pride that we can say the book project is definitely going well. The book was launched to the public in late October 2009, and now 6 months later we have a steady and stable stream of book updates (MEAP). In fact the book has been updated 5 times (incl. the first). This is strong testimony that we are on a good path towards the goal of having the book published in Q3 2010. Also we are very proud begin able to offer frequent MEAP updates which ensures, you the readers, having a good feeling as well. I know as a MEAP subscriber myself it becomes frustrating when there are no updates for a long time, and the authors of the book, is not responsive on the Author forums as well. With the Camel book you will neither find yourself in such a situation. Also we make an effort to make every page of the book count with quality - you'll not find full pages with a maven dependency dump or a console dump of Tomcat starting, etc.. Having seen this in other books, you can't keep wondering that the writers was a bit lazy here, and that you would rather have had those dumps being cut; giving leg room for more pages with material that enlightens you. At this time we had our 3rd review by a selected review panel. The panel takes their time to read and review the material and provide critique and excellent feedback. Without the guidance and help from this panel, the book would not be in such a great shape, it is currently. The panel is also reassuring we are on the right path as the overall impression on the material is getting much better. They are rating the current material in top (4 or 5 out of 5). Today is sunday and yet another weekend I will spend writing on the book. Jonathan is busy on chapter 12 and I am hacking on chapter 8. That means the next MEAP update would at least contain 2 new chapters. After this there is only chapter 14 left. And then there is much more work as well, refining each and every chapter, having them copy edited (multiple times), reviews, indexing, appendixes, forewords, double checking code listings, etc. etc. But still we can start to see the light at the end of the tunnel. But yes writing a book definitely consumes a great deal of your leisure time.